Be the first to share your favorite memory, photo or story of CONNIE. This memorial page is dedicated for family, friends and future generations to celebrate the life of their loved one. 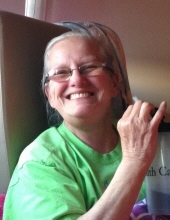 Mrs. Connie Sue Matthews, age 62, of Springfield, Missouri, passed away in her home on Saturday, March 23, 2019 with her family at her side. She was born on April 28, 1956 in Springfield, Missouri, the daughter of Cecil Junior and Betty Pearl (Sypolt) Brayfield. Connie was united in marriage to Michael Allen Matthews on November 1, 1974, enjoying almost 43 years together before Michael passed away on July 7, 2017. She was also preceded in death by three grandchildren; two brothers, Junior and Jimmy Brayfield; and a sister, Gene Brayfield. She was of the Pentecostal faith. Connie enjoyed being with her grandbabies, watching westerns, and quilting. Connie is survived by her two children, Chris (Cindy) Matthews, and Christina "Tina"Strodtman; three grandchildren, John Matthews, Abby Strodtman, and Leeann Matthews; her mother, Betty Perryman; a brother, Marvin Perryman; and a sister, Patty Hill; and other extended family and friends. To send flowers or a remembrance gift to the family of CONNIE SUE MATTHEWS, please visit our Tribute Store. "Email Address" would like to share the life celebration of CONNIE SUE MATTHEWS. Click on the "link" to go to share a favorite memory or leave a condolence message for the family.